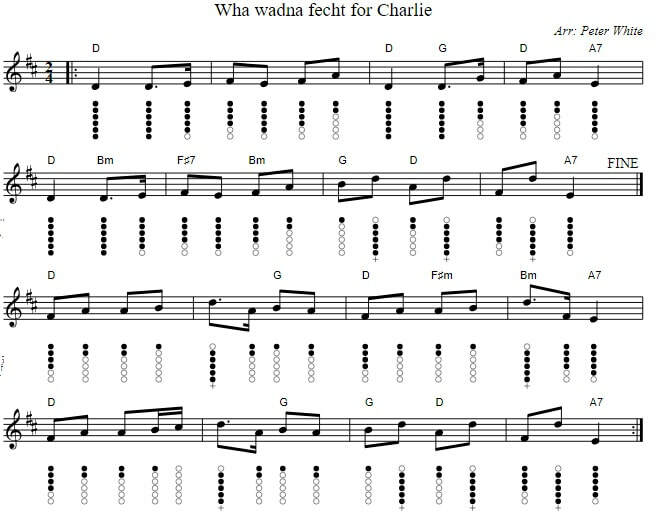 2/4 (traditional) Lyrics and chords will fit the Corries’ version although they used drums only but no guitars.​Wha wadna fecht for Charlie sheet music is also included along with the tin whistle notes. [C]Wha wadna fecht for Charlie? Wha wadna draw the the [G]sword? [F]At the [C]royal Prince's [G]word? [F]Wha the proud u[C]surper [G]quelled. [F]Highland [C]hearts as true as [G]steel! [F]Let us strike for [C]Prince and [G]Laws!